Tonight was a crunch night for the revived Doctor Who, perhaps more so than when it returned five years ago. Back then whilst there was a love for the old show, there was almost a suspicion that it wouldn’t fly, wouldn’t work with modern audiences. However fly it did, and despite a quick change of leading actor after only thirteen episodes under the hand of lead writer Russell T Davies it became a massive success. Not that everybody was happy. I know a good few long term fans who were less than pleased with the almost soap opera-ish aspects that RTD brought in, and thought that his plots were less than stellar. There were some good stories, the ones written by Steven Moffat being particularly noteworthy, but despite the detractors from within the existing fanbase it was a success. Last year with David Tennant the incumbent and incredibly popular Doctor having decided to move on, the production team saw it as a good time to move on also. For the fans, especially the RTD detractors there was much rejoicing when Steven Moffat was handed the lead writer role – hopefully that will bring a much better standard of plotting, and back to something more akin to the old Who the old fans were craving – but at the same time the RTD Who had proved massively popular with legions of new fans. Moffat then threw a total curve ball by picking an almost totally unknown actor, Matt Smith to play the title role. So as the UK sat down to watch, how was the first outing for Moffat Who? I’ll try and not give away too many spoilers, however in our household it was generally well received. The well plotted and entertaining Moffat style from his previous episodes has certainly survived his promotion. The episode kicked off with a great post regeneration sequence, including a sequence with food that was vaguely reminiscent of trying to find food for our daughter Lucy. Matt Smith is different from his predecessors, but still has elements of them. As Beth points out on a couple of occasions he delivers lines in a way that is much the same as David Tennant. Certainly his age doesn’t seem to matter. Like any actor taking on the role he’ll need probably the whole series to find his feet in the role properly, but he certainly seems to have made a good start. Karen Gillan also makes an impressive debut as the new companion, her frustration with the inability of the Doctor to keep time harking back to another companion who once famously said “A broken clock keeps better time than you, at least it’s right twice a day!”. Taking a look on Twitter after the show, whilst there are a few people who aren’t happy, the overwhelming majority seem to have enjoyed the show. Moffat does seem to have pulled it off, and the show has transformed once again. New music, new production team, new stars, new TARDIS even – but still Doctor Who. There must be a lot of pretty happy bookies this morning. If you check out the posted odds against potential new Doctor Who’s listed on Outpost Gallifrey Matt Smith is not listed, indeed his name only appeared in the press as part of a BBC Breakfast item. From that it can be pretty safe to assume that the bookies won’t be paying out much at all now the eleventh Doctor has been announced. It has to be said that the announcement came as somewhat of a surprise, perhaps most to the guys over at Doctor Who fan site Kasterborous who got a hot tip and announced Paterson Joseph as the new Doctor back in November, resulting in a bit of an embarrassing apology after the announcement yesterday. The thing to bear in mind is that although the production team, especially Russell T Davies were making lots of press comment about the casting process during the pre-publicity for the Christmas show, the senior members of the production team were totally changing, so despite the seemingly random names RTD was throwing about, the decision was made by Steven Moffat – RTD was told once the casting had been made, but had no input. The whole Paterson Joseph story seems to have started as a name amongst many, and his name in particular, partly thanks to his skin colour rolled up with events across the pond took off such that one bookie stopped taking bets on him as the new actor. Throughout all of this, Stephen Moffat kept quietly out of the limelight, and pretty much as expected made his own decision, casting the person that he thought really nailed the part, Matt Smith, a rising star who whilst his work has impressed, hasn’t figured large with most of the general public. He is unknown enough that BBC News has done a special â€œWho on earth is Matt Smith?â€? item. So what are my thoughts? I’m certainly inclined to trust the judgement of Stephen Moffat – they apparently saw Matt Smith second in the process, but carried on seeing a number of other actors, always coming back to Matt. Also, let us not forget that David Tennant certainly wasn’t a big star when he took the part, and earlier still Tom Baker was working on a building site when he got the part. Although well known actors have got the part in the past it is certainly not unusual for it to go to someone relatively unknown like Matt Smith. Years ago when Star Trek: The Next Generation did a two part episode, it seemed to be almost a given that part two would be a bit of a letdown, that the exciting cliff-hanger built up in part one wouldn’t go anywhere much in part two. Steven Moffat on the other hand seems to produce second parts that whilst they aren’t more of the same, are still equal to the first part. Take his episode of Doctor Who shown yesterday, Forest of the Dead, the conclusion of Silence in the Library. Whilst it continued from the end of the previous episode, the focus was rather different. The major focus last week had been on the Vashta Nerada, who this week were there as a threat, but with little further exposition, indeed by the end of the story they had not been defeated, but instead the Doctor had negotiated a truce with them in order to give him the time to rescue the four thousand people who had been saved by the central computer when the library had originally been taken over. This time the main focus of the story was on Donna, who had been saved by the computer, and was starting to live within the virtual reality within the computer itself. We also discover that the girl seen previously is in actual fact the preserved consciousness of a dying child, who had saved the occupants of the library, but was now struggling to keep the four thousand personalities in check. The mysterious Doctor Moon is in actual fact a representation of the moon of the planet, an artificial satellite placed in orbit to maintain the computer core. 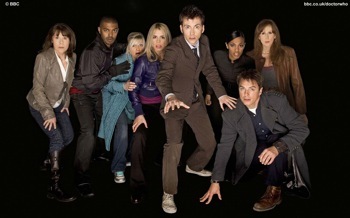 Whilst Donna is trapped in this virtual world, in the real world the temporal paradox around the Doctor and River Song is deepened when in order to persuade the Doctor that he should trust her, River reveals that she knows his real name – one of the longest running mysteries in the series (the title of the show is actually a question – Doctor who?) – needless to say it doesn’t get revealed to us the viewer. However the revelation is enough for the Doctor to trust her, to the point that he is caught out when she knocks him out in order that she might sacrifice herself to save the saved people of the library, rather than the Doctor. All is not lost however as thanks to the temporal paradox, the future Doctor knows when River is going to die, and has rigged the sonic screwdriver he gives to her to save her consciousness, allowing his past self to transfer her into the data banks of the computer. So after a tour-de-force from the new lead writer of the series, for the last four episodes we are back with the current lead writer, Russell T, with firstly a pair of lead character light episodes, Midnight being mainly the Doctor, and Turn Left being companion focused featuring Donna and the much anticipated return of Rose. Incidentally, if you weren’t up and watching TV this morning, you would have missed David Tennant talking about (amongst other things), his upcoming turn as Hamlet, plus a bit about Doctor Who, including the standard “when are you leaving” question, to which he gives the usual answer! However, you can catch up with the interview thanks to the BBC News website. So after months of speculation, the BBC has finally confirmed what most fans suspected, that Russell T Davies will be handing of the reigns of Doctor Who for the fifth season – the second part of the rumour is that David Tennant will be leaving at the same time, which hasn’t been confirmed or denied. â€œMy entire career has been a Secret Plan to get this job, I applied before but I got knocked back cos the BBC wanted someone else. Also I was seven. Anyway, I’m glad the BBC has finally seen the light, and it’s a huge honour to be following Russell into the best – and the toughest – job in television. The arrival of a new producer in the past often sees a change in direction or focus, and I suspect this changeover will be no different. Quite what will happen I don’t know, but certainly if his previous contributions to the series, and his other work on series like Jekyll, I, and I expect most of the fans have pretty high expectations – as he has said, one of the toughest jobs in television, with probably one of the most vocal fanbases too. Good luck Steven!